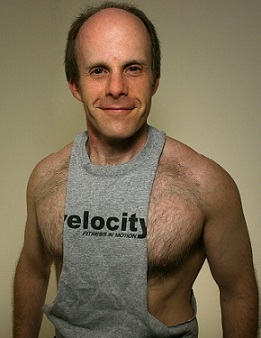 Charles is a Rome, GA native who has been working out since age 14. He graduated from Darlington School and went on to receive a BA in Journalism from the University of Georgia Grady School of Journalism in 1999. He worked in the entertainment industry in Los Angeles on such shows as Roseanne, Cybil, Cosby, and the Young and the Restless before returning to Atlanta to work for CNN. Charles retired from the TV business and moved to Darmstadt, Germany to teach English at the Berlitz School. After living overseas he moved back to Rome to work in real estate and is currently an agent with Toles, Temple and Wright, Inc. as well as being the owner of Velocity. Opening the gym has been a great opportunity for him to combine two of his favorite things... fitness and providing great customer service. 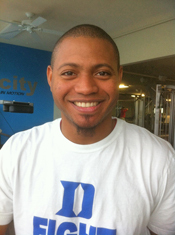 Charles speaks German and Arabic, is a member of the First Presbyterian Church and loves to travel when away from the gym. Charles' fitness regime includes organic foods, cardio and always plenty of free weights. Carolyn Carpino is a certified Les Mills RPM Cycling instructor. She is also certified as a Sports Nutrition Consultant and as a Nutrition & Wellness Consultant through AFPA (American Fitness Professionals & Associates). She has a B.S. in Chemistry from the University Denver and is a life-long student of science as it relates to daily life. Ten weeks of strict bed rest with her second child led her to make a permanent commitment to fitness, which she has continued for the past twenty-two years. Her two children have now established careers in Atlanta, so she has lots of time to pursue her favorite hobby - gardening with her husband. Carolyn is a Master Gardener and passionate about eating and living well. Amy is originally from Fayetteville, GA. She came to Rome by attending Shorter College from 2001-2005. Amy graduated with a Communication Leadership degree and little did she know that she would choose to stay in Rome, find work here, and marry her college sweetheart Josh who is a police officer. Amy was first introduced to the Les Mills Group Fitness Classes one summer in college and fell in love immediately. She went on to become certified in BodyPump in August of 2007. Growing up, Amy had a huge fear of public speaking and did not like any attention focused on her. Teaching classes came as a shock to some that know her. Somehow this is different, Amy loves the feeling of helping people achieve their fitness goals and watching people build confidence in themselves as they find themselves getting healthier and stronger. Amy's second certification came in April of 2008 with BodyJam and it became another favorite program. For Amy there is nothing quite like the feeling of dancing and just letting yourself go, and watching others go to that same place. Her third certification came in October 2011 for Sh'bam, another Les Mills dance class!! 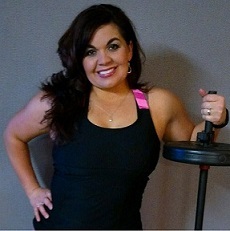 She now currently teaches BodyPump and BodyJam at Velocity loves every minute of it. Group Fitness is a huge part of Amy's life and she is so thankful that God has blessed her with the health and ability to help lead others achieve what they thought would never be possible. Amy is currently on maternity leave from teaching expecting her first child, a baby girl, in September 2017. Niki has been helping people reach their fitness goals since 1998 through group fitness. She has worked a several other gyms in Rome. She holds her Primary Group Fitness Certification with AFAA (Aerobics and Fitness Association of America) since 1999. She is a certified coach for the Les Mills GRIT Series and BodyPump. 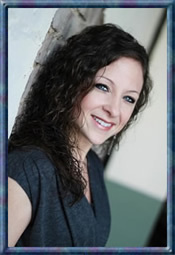 Niki can teach various class formats including Step Aerobics, Kickboxing, and Yoga. By trade, Niki is a Licensed and Registered Dental Hygienist who has been working in the dental field since 1997. Niki currently teaches Healthcare Science at Floyd County Schools' College and Career Academy and practices dental hygiene for various local dentists when school is out. A Rome native, Niki graduate of Pepperell High School. She is married with three children and resides in Armuchee. In her spare time she enjoys spending time with her family, kayaking, cycling, hiking, and watching her kids play sports, especially basketball. Her favorite fitness quote is, "There are two types of pains, one that hurts you and one that changes you." Her favorite life quote is, "Life is what happens while we are busy making other plans." Becky has been a group fitness instuctor since 2007. Her first certification was in kickboxing. About 6 months later Becky attended BodyPump training and fell in love with the Les Mills programs. She was certified for BodyCombat in 2008. Becky trained for the Les Mills RPM program in August 2012 which is her third Les Mills certification. An avid runner in high school Becky was always very athletic. She did not discover group fitness until she was 30 and it changed her life in more ways than one. Becky's husband Tom proposed to her while she was teaching BodyCombat. She and Tom were married in 2010. They have a blended family with 3 wonderful daughters. Staying fit is very important to Becky's family. She and her husband love working out together and all three girls stay very involved in school sports. 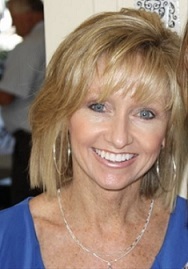 Christy has worked in the fitness industry since 1982. She has certifications in personal training and group exercise with specialist training in weight management, indoor cycling and boxing. 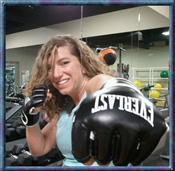 Her extensive teaching experience includes Cycling, Step, Kickboxing and High Intensity Interval Training. Christy has a dynamic and engaging personality. Her goal is to give you a great workout in her classes while making it fun and challenging. 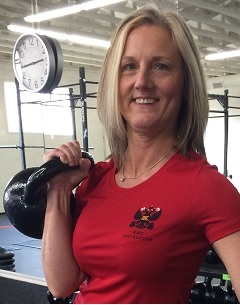 Teresa has been training with kettlebells for over 10 years. She gained her HKC certification in 2012 and completed her RKC certification in July 2014. As an instructor she is very motivational and attentive to coaching proper form. Teresa loves fitness and especially teaching kettlebells. She loves to train with kettlebells because they are exceptionally effective, efficient and simple. Kettlebell training is an effective strength and cardio session all in one. Teresa has a reputation for being very reliable, dependable and encouraging. Karin graduated from Plantation high school in Ft. Lauderdale, FL. She is currently certified by AFAA and NSCA for Personal Training. 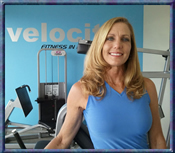 Karin has been in the fitness field for over 25 years. She lives in Summerville, GA. She is married with two children. Karin loves to swim, hike, bike and workout. Her Dad got her into fitness. Growing up he would make Karin and her sister push-ups and sit-ups in training for the competition of swimming. She swam for the Hall of Fame in Ft. Lauderdale. 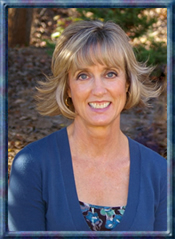 Karin trains hard and enjoys helping her clients reach their personal goals through hard work and commitment.